Our homes can have a powerful effect on our lives. Not only do they reflect our interests and daily responsibilities, they also impact how we feel physically, mentally, and emotionally. Decluttering can be a cathartic experience with benefits that resonate beyond material things. We learn the practice of letting go. We reflect on what we value most. We make space for change. We let more light in. Autoimmune disease is often a wake-up call for this type of priority-setting, and decluttering can be a way to de-stress and support our health. My guest Courtney Carver has multiple sclerosis herself, which inspired her decade-long journey into simple living. She is the author of the blog, Be More with Less, and the upcoming book, Soulful Simplicity. 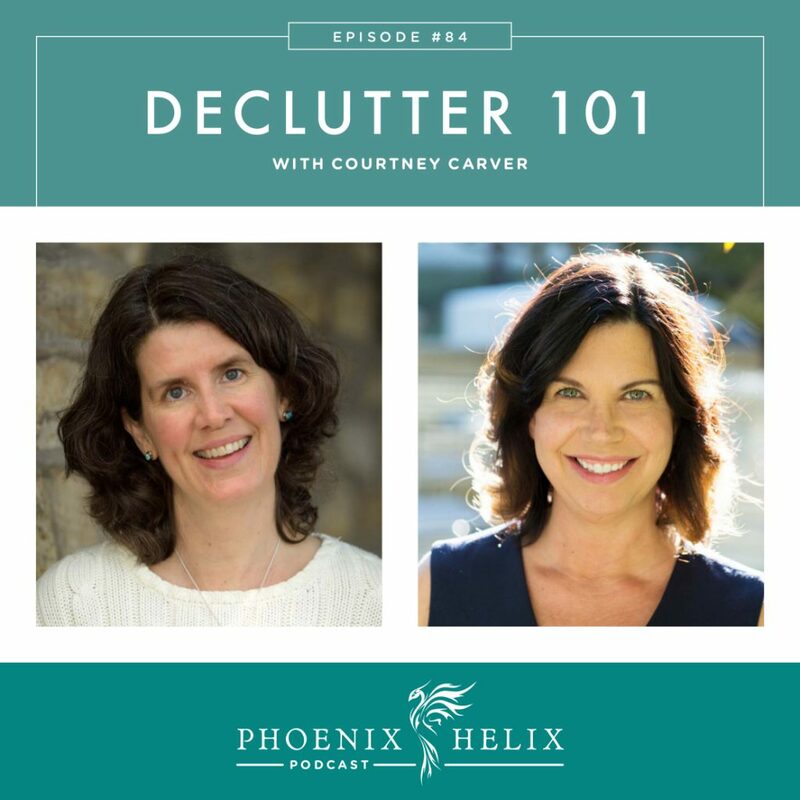 Today, we share practical tips for decluttering everything from our homes, to our emails, to our hearts and minds. I just completed a year-long decluttering of my entire home: every room, closet, drawer, and file cabinet. We gave away truckloads and have never felt more abundant. This process was actually inspired by a larger decluttering in my life: paring down work, debts, and even outdated beliefs and fears. The theme was letting go of what no longer served and making room for what matters most. It was a transformative year, and the process continues. I'm learning to experience the feeling of doing enough, having enough, and being enough. 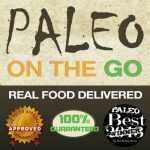 Paleo on the Go updates their menu seasonally, and they have a wide variety of comfort foods for Fall: soups, stews, roasts, and lasagna, to name just a few. On the weeks between podcasts, I write articles on my blog. There is always a new Paleo AIP Recipe Roundtable. Last week, I also wrote an article on Navigating a Flare-Free Holiday Season. If you don't want to miss out, subscribe to my weekly newsletter. 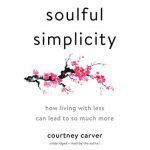 Courtney Carver is the blogger behind the website, Be More With Less and the author of the upcoming book, Soulful Simplicity. When she was diagnosed with multiple sclerosis a decade ago, she was living a fast-paced life that included high debt, long work hours, and shopping as a favorite hobby. MS was a wake-up call, and she decided to support her health by eliminating as much stress as possible. She didn't know what that would look like, but as she began to make changes, the common thread was simplicity. Now, she hasn't had a relapse in 9 years. She feels healthier and happier in every way. There is a connection between outer order and inner calm. Open space tends to tap the relaxation response. Clutter often taps the stress response, and it isn't always a conscious feeling. It's one of the reasons people feel they can breathe more deeply after cleaning their house. Clutter can feel chaotic. It can feel like a “to do list” of things that demand attention. It can feel claustrophobic. It can be a reminder of debt and overspending. It can also inspire self-judgment. All of these things are stressful, which is why decluttering can have such strong stress-relieving benefits that are long-lasting. Recognize that one tiny step can make a big difference, and you can start anywhere. Don't focus on your entire home, or even an entire room. Pick one drawer, or one shelf, or one tabletop. Do one thing each day, or each week. This makes it manageable, and also lets you build momentum. Keep an empty box by the door, and add to it whenever you notice something in your house that you don't use or enjoy. When it's full, tape it up and give it away, and replace it with another empty box. Consistency is more powerful than intensity. Find your “Why” – Why do you want to create space in your life? What are the small goals, and what are the larger goals? Write them down and post them somewhere. That will help you stay motivated through the decluttering process. This also helps serial declutterers – those who refill the open spaces with new things. You choose 33 items of clothing/shoes/jewelry/accessories. For 3 months, you only wear those items. Remove other items from your closet, and put them into storage. After the fashion challenge you can decide how many of those stored items you want to keep vs. give away. Project 333 has a way of clarifying those choices and making them easier. When Courtney did this the first time, she dealt with major weather fluctuations, as well as business and casual clothing needs. She still managed very well with just 33 items and loved the experience. Resource: Courtney has created a micro-course to guide you through this challenge. Focus on your stuff, not theirs. You usually have plenty to declutter before needing to involve anyone else. People are more inspired by actions than words. If they see the benefits you receive from decluttering, they may want to try it themselves. Gentle conversations. Forceful arguments often raise people's defenses. Instead, explain why decluttering feels important to you and how it can benefit the family. The goal of decluttering is to decrease stress, not add stress. Everyone needs to be able to move at their own pace and readiness. Resource: 7 Ways to Encourage Simplicity at Home. This is advanced decluttering. Don't start here. Build your “letting go” muscles first. How are you holding on to them now? Are they in storage? Do you even see them on a regular basis? Do you use them or enjoy them at all? Can you bring some favorite items into your daily life that symbolize the rest, and let the larger collection go? You can still have the memory without holding onto the item. A bridge measure is to take photos of sentimental items and then give the actual item away. Divide your list into 3 categories: Need to Do, Wise to Do, Nice to Do. It really helps clarifies priorities. When Eileen did this, she was able to let go of everything on her “nice” list. She accepted she wouldn't get everything done on her “wise” list either, but everything on her “need” list, she accomplished. In addition to determining if something is necessary, also ask yourself if it has to be done by you? Embrace the philosophy of doing less. We often measure our self-worth by our productivity, but there are other definitions of a successful life. How do we treat people? 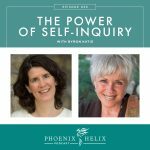 How do we take care of ourselves? How do we feel? Build margins into your daily schedule. Trying to fill your entire day with commitments and responsibilities is a recipe for stress and a setup for failure. Because life happens, and you haven't allowed yourself any wiggle room. Also put self-care and pleasure on the schedule. Technology has many benefits and connects us with people around the world. But it's also very distracting and often disconnects us from our in-person life. Boundaries are essential. 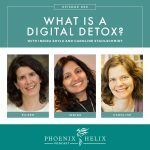 Disconnect from the internet on a regular basis. It might be 1 hour when you wake up in the morning, or 2 hours at lunch, or evenings after 7pm. Both Courtney and Eileen do a full 24-hour day each week. Create some firm, technology-free time in your life. Create technology-free zones in your house as well. It might be your dinner table and/or your bedroom. Smartphones in the bedroom can cause insomnia. Turn off notifications on your smartphone. Create distraction-free zones while on your computer. Resource: Ommwriter. Just like other forms of decluttering, consistency is more important than intensity. Courtney's favorite method is a Morning Routine. It begins her day peacefully, makes her less reactive to stress throughout the day, and it's an intention-setting time, reminding her of who she is and what she values. A gratitude practice is a wonderful way to end the day. Write down 3 things for which you're grateful – they don't have to be big. In fact, it's the small things that make up the fabric of our lives, and appreciating them can be a powerful shift in perspective, especially on difficult days. She lives in a smaller home with less upkeep. She left her fast-paced career in marketing, to become a self-employed writer and speaker. Future simplicity goal: She would like to try an internet-free week: 7 full days offline. First, figure out your Yes List. That establishes your priorities. You have to say no to other things to have time for what's on this list. Exercise: Say No to everything for a few days. It's a way to practice without having to pause or think about it. Notice how this creates space in your life. Notice how saying no gets easier with practice. Pay attention to where you wish you could have said yes, and where you were grateful to have said no. Resource: Boundaries and the Art of Saying No. Courtney Carver is is the author of the blog, Be More with Less, and the upcoming book, Soulful Simplicity. She has preorder bonuses through her website if you order the book before 12/26/17.